1ST 10 DRUMMERS TO BRING IN THEIR SNARE WILL GET A FREE EVANS BATTER HEAD AND TUNE-UP. 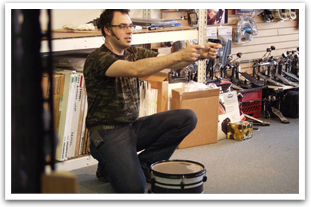 Josh Touchton started destroying drums at the tender age of eight. From that point nothing was sacred and the quest for optimum drum sounds started. Josh always took extra time in set up and tuning, getting great drum sounds was key to stage and studio performances. In 1993 Josh’s tuning was taken to the next level when he met and studied (or ate copious amounts of Mexican food to be more exact) with legendary Billy Cobham and John Bonham drum tech, Jeff Ocheltree. Jeff accepted no less than perfection of sound for the drum, room, or song, and even less for the complete understanding of what it took to get to that level and the same was demanded from Josh. Also that year Josh began working in tandem with Gibson Custom Shop guitar tech Ryan Futch, working on the southeast festival circuit and getting to work with such acts as The Band, Wilco, Fishbone, the Bottle Rockets, P-Funk, Jeff Healey, Willie Nelson, B.B. King, the International Blues Festival and the W.C Handy Awards. In addition Josh has gotten to tech in tour, studio, and in clinic settings for Bernard Purdie, Gregg Bissonette, Nick D’Vigilio, Big Country, Wilco, and Emmylou Harris and has built drums for Saliva, Wilco, Dwight Yoakham, Smashmouth, Gregg Bissonette, ELO, Mark Schulman, Mark Brzezicki, Gary Husband, Brady Blade, and Steve White and has had his drums heard commercials from Honda and Sears and several Grammy nominated albums. 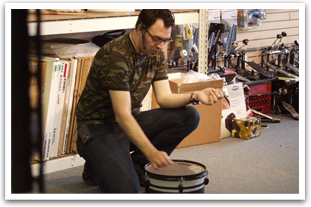 The Evans Tune up Clinic is a great way to learn about keeping your drums in tiptop shape through following several simple steps. It’s a great way to make your sound heard in studio or live settings. More than anything it help develop the drummer’s own personal sound so that he or she will stand out.